Take ZEN BOX From Sublime Beauty Naturals® For a "Test Drive"
The New Monthly Subscription Box, ZEN BOX, Has Set Up a Single Purchase of its February Box so those Interested Can Test it. The First Box Includes Frankincense, Lavender and Immune Boost Essential Oils. Take ZEN BOX for a "test drive". The inaugural February box is made available as a one-time purchase. ZEN BOX, a monthly subscription box of therapeutic quality essential oils, is available on a one-time purchase basis for those who would like to test it before committing. "We know that essential oils are relatively new to many, and wanted to allow one-time purchases of our February box," says Kathy Heshelow, founder of ZEN BOX and Sublime Beauty Naturals. "We included essential oils that everyone should have: Lavender, Frankincense and the Zen Immune Boost Blend." Those who purchase will also received a Profile Information Sheet, to learn more about each essential oil, how to use them and interesting facts. This week ONLY (to Saturday March 12th 2016), a 25% Off discount is available with coupon code TESTDRIVEZEN. Copy the code and purchase here. 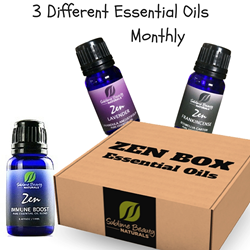 Subscribers who want to join the ZEN BOX family for monthly delivery sign up before midnight of the 15th each month; the boxes are shipped the 20th; and rebilling is the 30th. Subscribers have full control of their account, and have a chance to earn a free box when they refer 3 friends who subscribe.